Fairweather Festival is a 2-day boutique family festival held on the Isle of Wight with one goal, to make a difference. With some of the biggest artists from around the world performing, there truly is something for everyone. Fairweather Festival began as a project to use live music and the freedom of music festivals to make a difference to young people's lives and in particular, raise vital awareness on mental health and aspects surrounding it. 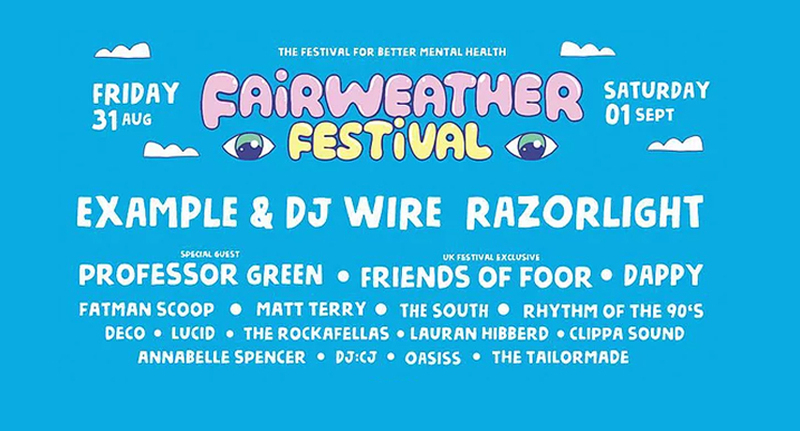 Whilst donating a large percentage of profits to a chosen charity each year, Fairweather Festival will invite many mental health services and charities along to promote their incredible work and offer guidance towards potential help if it is needed in the future. The main goal is to stamp out the stigma surrounding mental health by using the worlds biggest communication method - Music. 2018 they are keeping it local and supporting the Isle of Wight Youth Trust. They are aiming to raise funds to support their future in delivering outstanding mental health services across the Isle of Wight.